Glenwood Springs senior point guard Maddie Bolitho steals the ball away from the Mountain View Mountain Lions during Tuesday night's playoff game at Glenwood Springs High School. Glenwood Springs senior Tatum Peterson rises up for a shot during Tuesday night's 4A CHSAA first round state playoff game inside Chavez-Spencer Gymnasium. 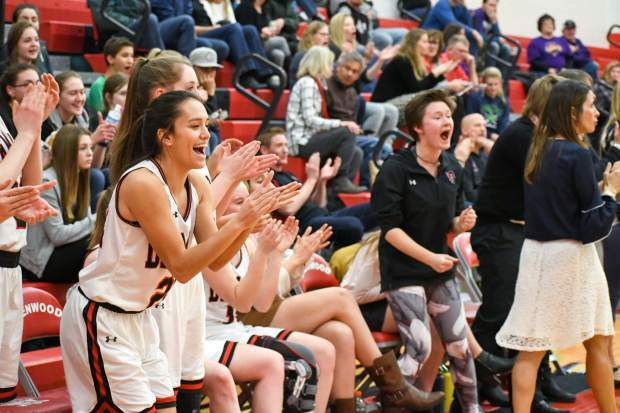 The Glenwood Springs bench cheers for the team during Tuesday night's playoff matchup with Mountain View. Glenwood Springs senior guard Maddie Bolitho dribbles past a Mountain View defender during Tuesday night's first-round playoff game at Glenwood Springs High School. 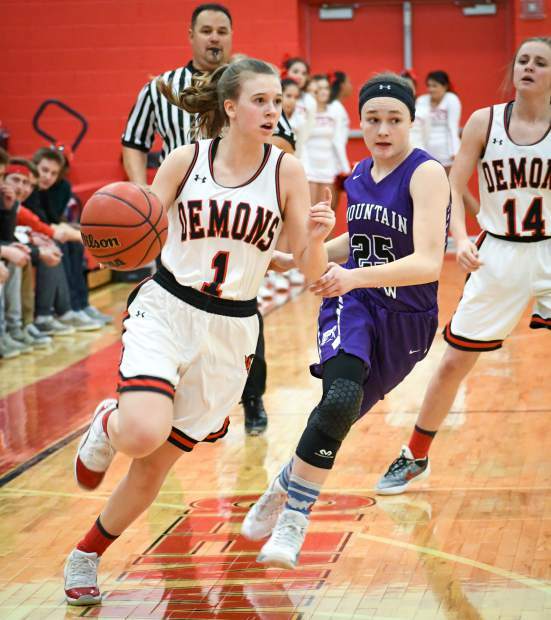 The sting of defeat in the 4A state playoffs to end the 2017 season at home was something that was hard to deal with for the Glenwood Springs Demons girls basketball team. 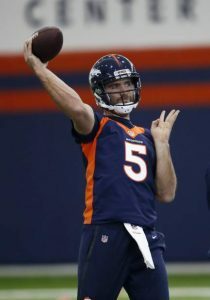 In a similar position this season, hosting the No. 36 Mountain View Mountain Lions Tuesday night inside Chavez-Spencer Gymnasium, there was no chance the Demon girls would allow the same result. Not this time. 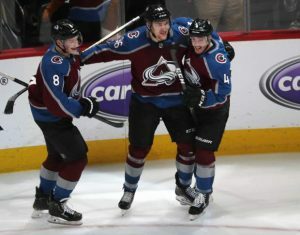 Using the experience gained from last season’s playoff appearance, and a high-octane offensive attack that shot the lights out of the gymnasium, No. 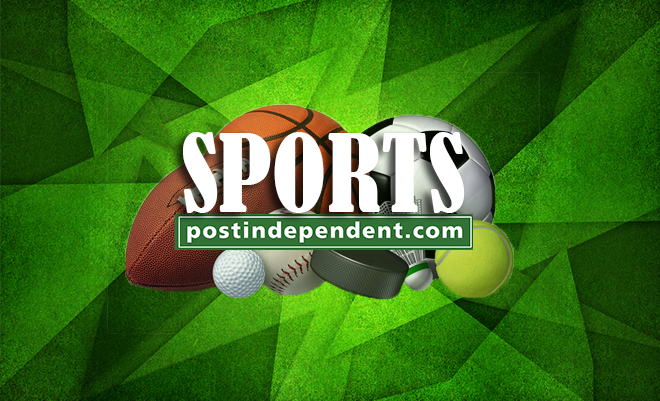 29 Glenwood Springs rolled to a 63-52 win over the visiting Mountain Lions, holding a lead as high as 18 points midway through the third quarter before Mountain View battled back. Right from the opening tip it was quite clear the Demons were locked in, led by senior center Tatum Peterson, who poured in a game-high 26 points on the night. On Mountain View’s first possession, Peterson blocked the shot of Mountain View senior Laura Lenhart, and then ran the length of the floor to hit a layup off of an assist from Glenwood senior point guard Maddie Bolitho, jump-starting the Glenwood attack. Glenwood and Mountain View traded shots in the first quarter as Mountain View junior Raleigh Basart hit a layup and two free throws, while Bolitho hit a runner to give Glenwood a slim 7-6 lead, until two straight 3-pointers from Glenwood senior Ellie Moser stretched Glenwood’s lead to 13-9. A 3-point play from Lenhart made it 13-12, but Glenwood sophomore Natalya Taylor hit a layup to make it 15-12. 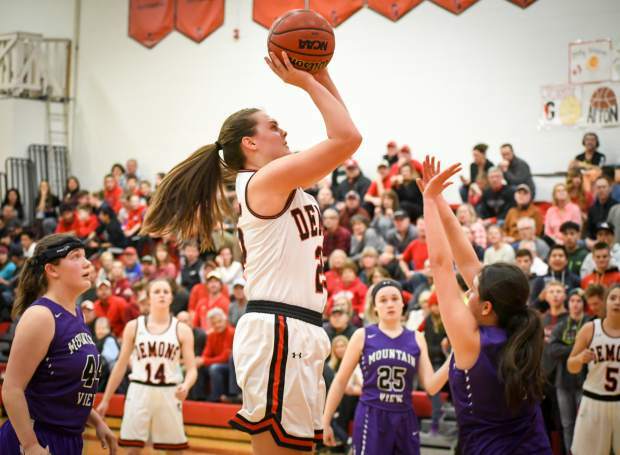 The Demons could have had a 17-12 lead after one quarter of play when Taylor hit a layup at the buzzer off of a great inbounds play, but the officials waved it off, sending the two teams into the second quarter with Glenwood in front by three. In the second, Glenwood senior Dani DeCrow and Mountain View senior Peyton Duke traded buckets, but following Duke’s runner, Glenwood embarked on a 9-0 run, led by a putback and a 3-point play from Peterson, who started to feast on the Mountain Lions’ defense due to her size advantage. DeCrow and Taylor capped off the run for the Demons with layups before Mountain View freshman Kelsey Basart hit a 3-pointer to stop the run. But buckets from junior Ximena Gutierrez and Peterson to close the half sent the Demons into halftime with a 30-20 lead over the Mountain Lions. Sitting 16 minutes away from a first-round win at home, the Demons came out scorching in the third quarter, putting up 20 points as a team. However, Mountain View answered with 21 points in the quarter to stay in striking distance. Peterson stayed red-hot to start the second half, grabbing an offensive rebound and getting the putback shot to fall, while Moser hit her third 3-pointer of the game, giving Glenwood a 35-21 lead. A jumper from Peterson stretched the lead to 16 points, but two straight buckets from the Mountain Lions stopped Glenwood’s run. Unfazed, Moser stepped into her fourth 3-pointer of the game, keeping the Demons’ attack clicking on all cylinders. 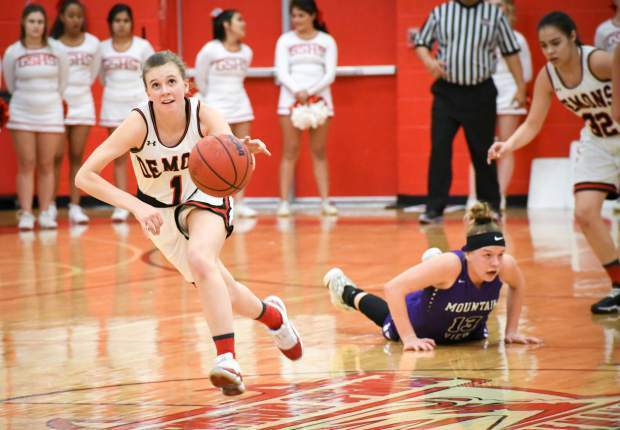 Following a 3-point play from Mountain View, Glenwood went on a quick 6-0 run to take the largest lead of the game at 46-28, as Gutierrez, Peterson and senior Saylor Warren hit tough shots in the paint, but at that point the Demons seemed to lose some focus, allowing the Mountain Lions back into the game. Jumpers from Raleigh Basart and Kelsey Basart, and one free throw each from Duke and senior Kali Kelley pulled the Mountain Lions to within 12 points midway through the third quarter. Peterson got the Demons back on track with an elbow jumper off of a great feed from Taylor as the sophomore cut baseline, bouncing the pass to Peterson through two defenders’ legs, but Mountain View closed on a 7-2 run, led by Raleigh Basart, to make it a 50-41 game heading into the final quarter of play. In the fourth, Glenwood started on a 4-0 run as DeCrow split a pair of free throws and then buried a 3-pointer from the left corner, but Raleigh Basart wouldn’t let the Mountain Lions go quietly, hitting a 3-pointer and a tough layup in transition to make it 54-46. Taylor and Kelley then traded 3-pointers, but Peterson took over in the paint once again, hitting a layup off of a great pass from Bolitho over the top of the defense, before then racing in all alone for an offensive rebound and the putback shot to stretch Glenwood’s lead to 62-49. With 3:31 left in the game, Raleigh Basart fouled out on an offensive foul, forcing the Mountain Lions to play without their best offensive player down the stretch. At that point, Glenwood was able to hold the ball and run out the clock, picking up the 63-52 win to advance to the second round of the playoffs. In the win, Peterson led the way with a double-double, pouring in 26 points, grabbing 14 rebounds and blocking four shots for the Demons. Bolitho was quiet in the scoring department, recording just 3 points, but the senior was a terrific ball distributor on the night, dishing out a game-high 10 assists. Moser scored 12 points on the night — all on 3-pointers — and grabbed three rebounds for Glenwood, while Taylor added 8 points, three rebounds and three assists. DeCrow chipped in with 8 points, while Warren ripped down 10 rebounds on the night. 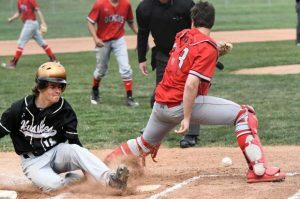 By defeating the Mountain Lions, Glenwood sets up a second-round matchup with the Windsor Wizards (19-4, 13-1 4A Tri-Valley League) Friday night in Windsor.